We've been living in a tipi with a fire ring this season and are about to put up a yurt! 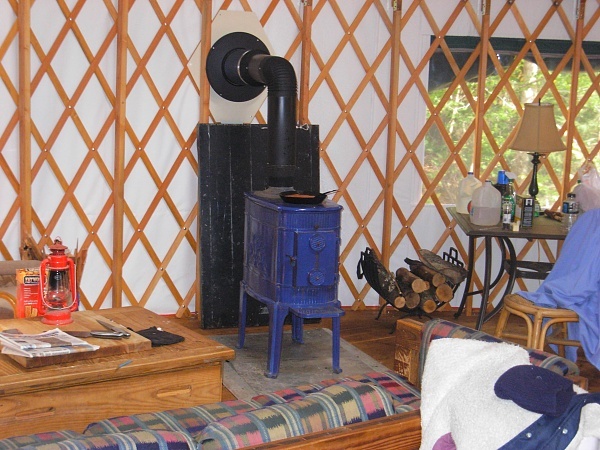 We're still nomads so will most likely move again and are thinking about a hearth for under our cook stove. It needs to be movable. What's under your woodstove? How heavy is it? Pictures would be fun! Re: What's under your woodstove? I just have a piece of cement backer board as I am not sure if I am going to keep my current stove or not. Lemme see if I can find some pics..
1/2" concrete backer board. 20" extension in front of stove footprint, 8" sides and rear. Stove in middle of yurt. Nice stove Jafo. Thanks for the photo. At first, I was thinking of doing slate pieces or tiles on the backer board but that isn't very movable. So we figured a piece of stainless or even metal roofing would work just fine. Our stove will be in the center. Thanks for sharing your dimensions Robo. I've been checking out hearth sizes lately and was think at least 8" past the stove would be ideal.